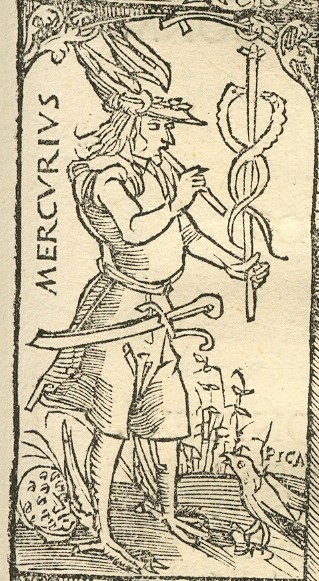 Tarot context: Arthur M. Hind in his "Early Italian Engravings", 1938, gives the information, that Michel Wolgemut made woodcut copies or adaptations of the motifs of the socalled Mantegna Tarocchi for a finally unpublished work of the editor Peter Danhauser, Archetypus Triumphantis Romae, between the years 1493 - 1497. 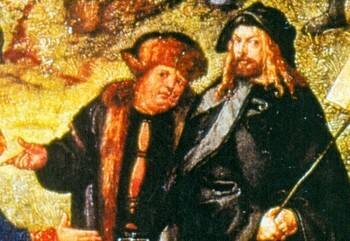 From Dürer, in the years 1486 - 1490 pupil of Wolgemut, it is assumed that he painted at least a part of his pen paintings of the Mantegna Tarocchi in 1495 during his visit of the city of Venice - it's unknown, if his not completed work has a relation to the book project of Danhauser and Wolgemut. According to Michael Hurst the woodcuts of Wolgemut contained motifs of the Mantegna Tarocchi and motifs of Petraca's Trionfi series. According to Hind the existent woodcuts contained the Mantegna Tarocchi motifs Nos. 11, 12, 13, 15, 17, 18, 19, 22, 27, 28, 29, 34, 35, 37, 39 and 42. Other informations: Sebald Schreyer, with his brother-in-law Sebastian Kammermeister financing sponsor of the "Schedel'sche Weltchronik" 1993 and already 1490 cooperating with Danhauser, was also active in the project Archetypus Triumphantis Romae, it seems, that also the leading humanist Celtis participated (in a letter exchange between Danhauser and Celtis Danhauser mentioned, that Celtis had taught him philosophy). After 1493 motifs of the Mantegna Tarocchi accompanied writings of Celtis and Muses decorated the living rooms of the Nurremberg humanist Pirckheimer, a friend of Albert Dürer. 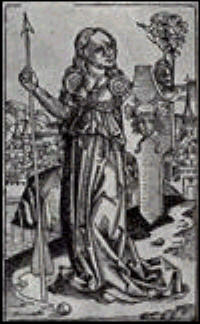 Nurremberg and in consequence Germany used the Mantegna Tarocchi to spread and influence German humanism. Son of the painter (?) Valentin Wolgemut, started to wander as a painter around 1450 (probably in Flandern) and was before 1471 in Munich in the workshop of Gabriel "the painter of Munich" (probably Gabriel Mäleskircher), where he tried to marry Magdalena, the daughter of the painter, which was promised to him, but he was refused finally and lost in a process. In 1473 he married the widow of the Hans Pleydenwurff (ca. 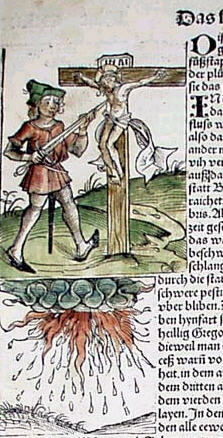 1420 -1472), the major artist in Nuremberg, whose workshop he took in cooperation with the son of the painter, Wilhelm Pleydenwurff. Although as artist considered to be of lower quality than Pleydenwurff, he established successfully as leading workshop in the city, engaged in religious paintings and woodcarvings, even stained glass windows. His major contribution, however, became (working in cooperation with his partner Wilhelm Pleydenwurff) about 1800 different woodcuts in the famous "Weltchronik" of Schedel. 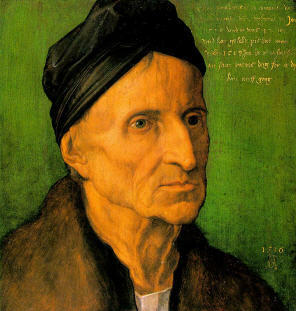 In 1493 already about 60 years old, Wolgemut reached an high age and stayed active till his death in 1519 (his partner Wilhelm Pleyendorff died 1494). 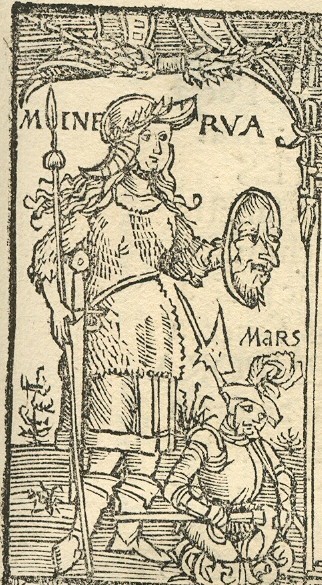 Mercury and Minerva in an edition of Celtis' "Germanie"